Once you request a VMware-based private cloud from MacStadium, the MacStadium provisioning team will create a ticket that you can access via the MacStadium portal, which contains your connection information. In the “IP Plan” document, you’ll find the necessary information for gaining access to your private cloud, instructions for accessing your vCenter, your IP allocation, your host assignments, and more. Before you can gain access to your MacStadium VMware private cloud, you must first configure your firewall which for security reasons initially blocks all access by default. Our recommended method, and the one most MacStadium customers follow, is to access your VMware private cloud via a Remote Access VPN. Once you’re connected via VPN, you can connect to your vCenter instance over a secure connection. Use the information in the “IP Plan” available via the MacStadium portal to find the address of your vCenter web client and your login credentials. Otherwise, if you are using the Flash version and you receive a white screen, you might need to whitelist the site in your browser. In Chrome, this is under Content Settings > Flash. You will need to add an exception to allow for the IP address of your vCenter host. Then, refresh the original page and it should load. 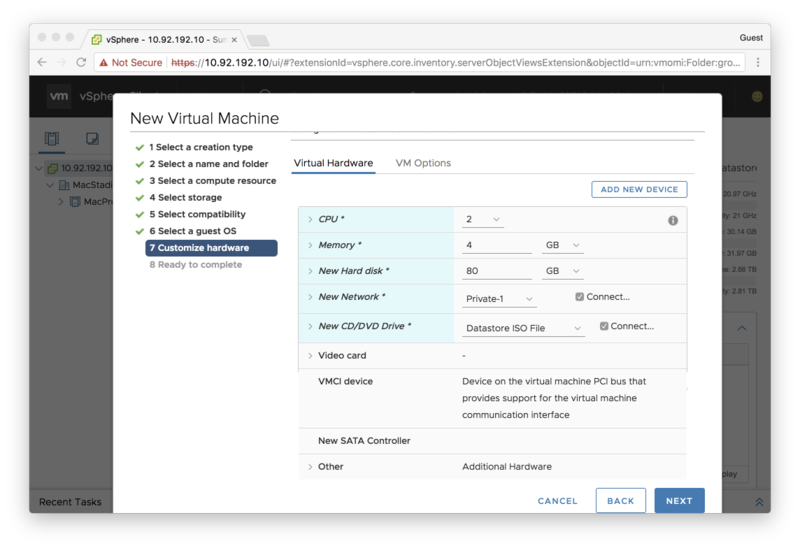 You should now be able to see the vSphere client in your browser. 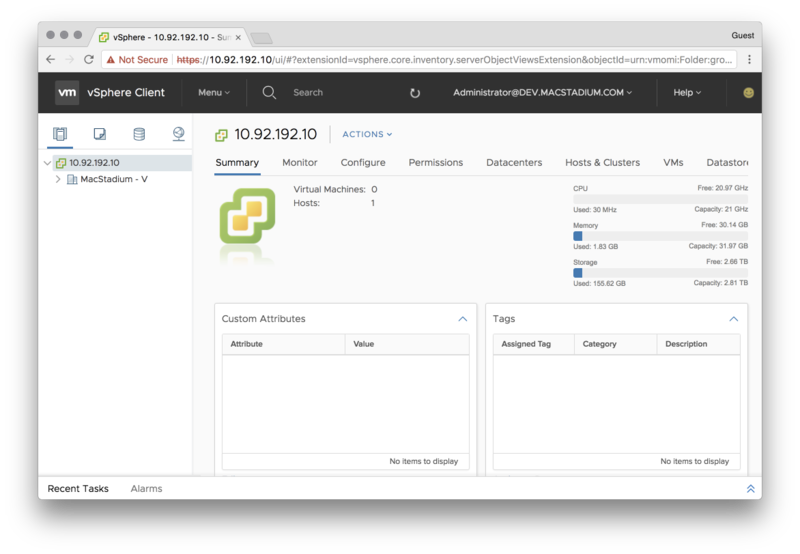 The MacStadium private cloud options you selected will determine the number of physical hosts you see in your vSphere cluster. As you grow, this ultimately lets you manage multiple networks or groups of hosts within the same interface. 2. Select “Create a new virtual machine” and then select Next. 3. Choose a name, e.g “macOS-10.12” and then select Next. 4. In “Select a compute resource,” click Next. 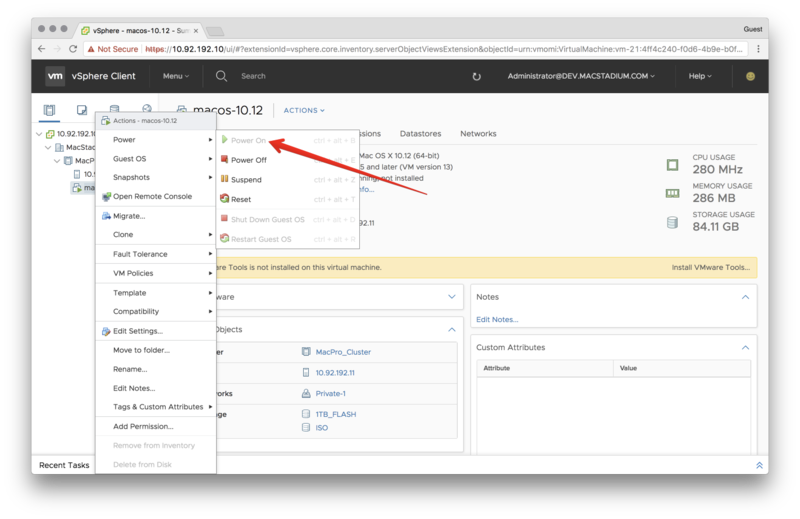 If prompted, select a specific host to deploy to if your cloud doesn’t have [DRS Mode] turned on. This just means that your image will run on that specific host vs. VMware determining a host for you. 5. Select the datastore for your VM’s files (generally you will only have one of these). Select Next. 6. Select the default presented for Compatibility and then Next. 7. Select Guest OS Family "Other" and Guest OS Version "Apple Mac OS X 12.13 (64-bit)." Don’t worry that this won’t match the actual macOS version; we only need one that is close. New CD/DVD Drive: Datastore ISO File. Select ISO > OSX > macOS_Sierra.iso. Ensure that Connect is ticked. 9. Check to see that your summary looks correct, and then Finish. Shortly after finishing the wizard, you should now have a virtual machine listed within your cluster in the web interface. 1. Right-click on the virtual machine and select Power > Power On. 2. Click on the virtual machine and then click on the preview image. You should now see the macOS installer initializing. 3. Get up to the “Install macOS” screen. If you only see the DVD image, you will need to select Utilities > Disk Utility from the menu. 4. Wait for the installer to run. 5. When at “How Do You Connect”, select Local network (Ethernet). 7. Skip Location Services and Apple ID. 8. Create an Account and note the account details. 9. Set the time zone to your local time. You should now be on the desktop with a working Mac virtual machine. VMware has a set of tools that must be installed on macOS. These get mounted via a virtual CD drive. You can find instructions from VMware here or use this guide below to install or upgrade your tools manually. Download a recent version of VMware Tools and unzip it so that you have a darwin.iso. Login into your vCenter instance. Use your storage tabs to navigate to your datastore. Browse your datastore. You can upload the ISO to the root folder or create an ISO folder. Shut down your machine from within macOS. From the web interface, right-click on your virtual machine and select Power > Power Off. Right click on your virtual machine and select Edit Settings. Change CD/DVD Drive 1 to Datastore ISO File and select the ISO you uploaded. Right-click on your virtual machine and select Power > Power On. After the reboot, go back into the desktop of the virtual machine and log in. Install the VMware Tools when prompted. During the tools install, you will get blocked by a security exception from the macOS; step through and explicitly allow it. This happens during the steps of the UI installer and is necessary to allow the VMware signed tool to make modifications to the OS.